Twelve, 12 oz. hand-crafted beers each month from both U.S. craft microbreweries and International breweries. You'll get four different beer styles, three of each style. 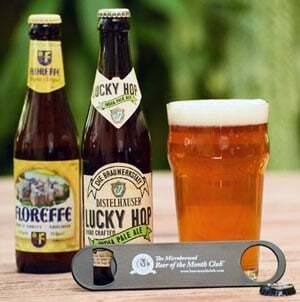 Our U.S. & International Variety Beer Club offers the most variety of any of our beer clubs. You or your gift recipient will enjoy exceptional and award-winning American craft brews, plus uncommon imported brews representing the cutting edge of the craft beer renaissance overseas as well as traditional styles brewed at their source – often from breweries several hundred years old in such famed brewing countries as Germany, Belgium, and England. Two of the featured beer styles will be U.S. craft beers and the other two will be imports. All beers are brewed to order by our featured breweries and imported especially for club members. Members will also receive our Malt of the Earth newsletter in each shipment, offering detailed tasting notes for each beer, brewery histories, food pairing recommendations, and beer specifications (style, ABV, recommended serving temperature, etc.). All U.S. & International Variety Beer Club members can re-order their favorite beers while supplies last!